Enjoy holidays in the Mount with all the excitement that comes with this superb location; its vibrant cafe culture or range of outdoor activities from lazing on the beach to walking up the Mount. 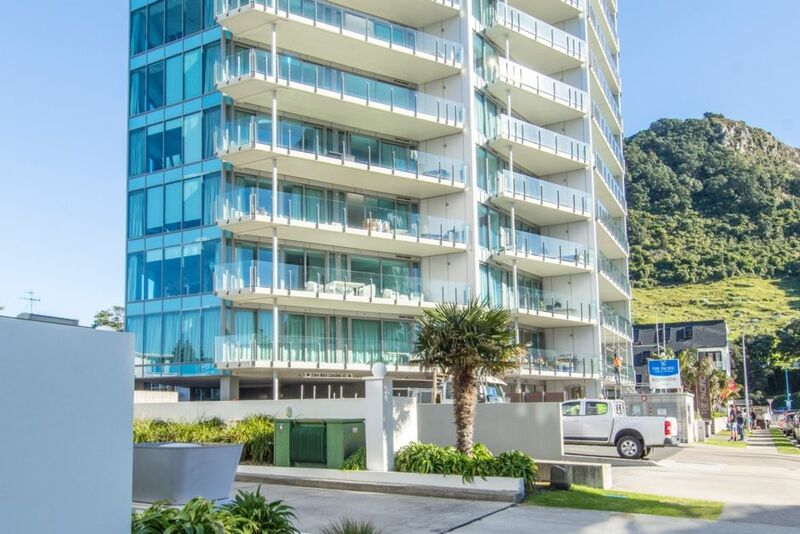 We are perfectly situated between the gorgeous Mt Maunganui Surf Beach and Pilot Bay, with the legendary Mountain as your backdrop. The Mount Hot Pools are across the road and public transport within 50 meters. Secure parking included. Our guests can use the gymnasium and outdoor swimming pool complex. First floor, wheelchair friendly, no sea view. You may arrive anytime from 4pm, check out is by 11 am on the day of your departure. Maximum 4 people per booking. My family and I were in town for 10 days whilst visiting friends in family back in the Bay. Couldn’t of asked for a better spot to enjoy the tail end of the kiwi summer!! Thanks for everything, we wouldn’t hesitate to come back in a second!! Fabulous place for a fantastic time! Really top notch apartment will book for a week or two next year when we return . Amazingly quiet and well kept property . The location is walking distance to the main shopping street and has good security. The apartment is fairly new. Good spacious rooms and great to have 2 bathrooms. The kitchen is well equipped. The apartment is well equipped with air conditioner and heating system. The building has a gym, pool and spa. The only comment will be that the pool was cold therefore didn't result in spending lot of time in there. The owners provide good information upfront for the key location, parking etc. They are also accessible if there is any problems. Definitely recommend this property and will look to stay there at another visit to the Mount. Lovely place to stay. Very neat and tidy with nice presentation. Big kitchen to cook in, big balcony also. Right In the heart of town. Nice & convenient. Definitley be back. A very clean and tidy apartment in a handy location. A very clean and tidy apartment in a handy location. We had a lovely relaxing stay here. Thanks so much. Very spacious apartment, everything we needed. Very spacious apartment, everything we needed. Clean, tidy and comfortable beds. Excellent location.